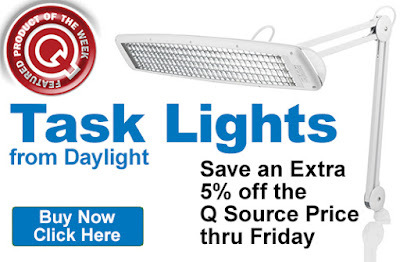 Save an extra 5% off the Q Source price on Daylight Task Lights. Get this discount when you add an eligible task light to your shopping cart. Our Featured Product promo is valid Monday, May 22, 2017 and runs through Friday, May 26, 2017. Eligible Daylight Task Lights include Slimline LED lamps, artist lamps, hobby lamps, and more. Please visit the individual product pages for more detailed specs and features. Click here to shop for eligible Daylight Task Lights. For further questions, call us (800-966-6020), or send us an email. Please note: This promo is valid only at QSource.com and expires on Friday, May 26, 2017.